Bed bugs are tiny parasites that seek out sleeping people or animals for a blood meal. They are attracted to the CO2 that you exhale, your body heat and your smell. After feeding, they hide. It is extremely challenging, but not impossible, to prevent, detect and control bed bugs. In most cases, pesticides alone will not eliminate bed bugs. Integrated Pest Management (IPM), needs to be implemented for effective bed bug control. IPM is an environmentally sensitive approach to pest management that relies on knowledge of the pest and a combination of common sense practices, such as inspection, monitoring, reducing clutter, sealing cracks, the use of barriers, non-chemical methods and the judicious and careful use of pesticides, if needed. Vacuuming reduces bed bug populations. Clean and vacuum bed bug prone areas daily. Immediately seal and dispose of vacuum bag. Install encasements on mattress and box spring. Make the bed an island: Keep bed away from wall and do not let bedding touch the floor. Install bed bug interceptors under bed and furniture legs. Remove clutter where bed bugs can hide. Keep clothing off of the floor. Isolate infested items in sealed plastic bags or containers. Seal cracks where bed bugs can hide. If you live in an apartment or other multi-family dwelling, and you see a bed bug, contact your landlord immediately. Bed bugs are not your fault. Anyone can have them. Items that cannot be washed or dried may be steamed, heated or frozen using specialized equipment. Raising the indoor temperature with a thermostat or space heaters will not kill the bed bugs. Launder bed sheets and clothing regularly. Dry for 30 minutes on highest heat setting. Put small items in a freezer for 4 days. Apply hot steam to infested furniture. Dispose of heavily infested items. Other methods available to professionals: Place items in heat chambers designed for controlling bed bugs. Visually inspect bed and sofa. Place interceptors under bed and sofa legs. Interceptors should be checked every 1-2 weeks. Diatomaceous Earth (DE): DE is a natural, white powder-like substance that kills insects. When used properly, bed bugs will have to crawl through DE around your home. Use only DE labeled for insects and follow the directions. Apply DE to cracks and crevices in walls, bed frames, spaces around the bed, behind wall plates and along junction of wall and floor. Wear a mask to apply DE. Apply DE dust to new harborages found during follow-up inspections. DE may take one to two weeks to kill bed bugs and two months to eliminate an infestation. Be patient. Continue to launder bed sheets at least weekly until bed bugs are eliminated. Make sure you have enough interceptors for legs of every bed, couch and plush chair. 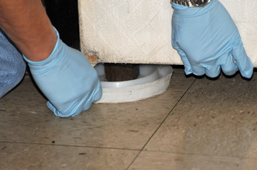 Conduct visual inspection and check the interceptors placed under the furniture every 1-2 weeks. Wipe interceptors clean using a cotton ball dabbed with talc. If no live bugs or their signs are noticed for 6 weeks, you may declare "the bed bugs are eliminated!" Adults are rusty red, and apple seed sized, 3/8”, with six legs, oval, and flattened from top to bottom. They do not jump or fly, but are good runners and hitch hikers. They tend to congregate together. Eggs are tiny, white and glued to surfaces. Nymphs are light colored, and 1/16th”. 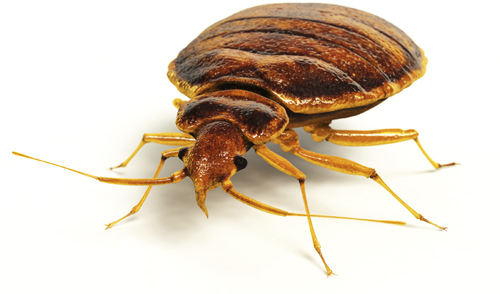 Bed bugs can live several months without a blood meal. 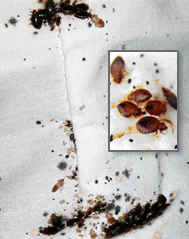 Infestations will leave small, yellowish shed skins and black and rusty spots on bed linens which are droppings and blood stains from crushed bugs. You may have red, itchy welts or rashes from bites; however, bite marks alone are not a reliable indication of a bed bug infestation, as bites could be from any number of other sources. Important, Be Sure Your Pests are Bed Bugs!! Capture and contain several examples of the pest and have them identified by a qualified expert before taking any further actions. Skipping this step could be an expensive mistake. Many people have been treated for bed bugs without actually having them. Blankets, bed sheets and pillows. Mattresses: along seams and piping, under handles and labels. In bed frames and head boards. Box springs: under the thin dust cloth, on bottom hidden in nail holes, cracks, by staples, and nails. Seams and folds of chairs and sofas. Under and along edges of wall-to-wall carpeting and padding. Cracks, crevices or nail holes in walls, and under wood moldings. Under loose wallpaper and seams. In and behind picture frames and mirrors. In clothing and clutter stored under beds, in closets and elsewhere. Inside switch plates, electrical outlets, and clutter around sleeping areas. On and in luggage, backpacks and bags. Proactive monitoring, early detection and prompt response will avoid larger problems.